One of the dishes that my husband loves to eat is a taste that he acquired while living in Israel. It is very common to use dips with the pita bread, and along side with techina and hummous, the "salad chetzelem" meaning Eggplant Salad, is one of the most common. It is called Baba G'noosh, (spelled also Baba Ghannouj or Baba Ghanouj) in the USA. We serve it and enjoy it even with our home made whole wheat bread. First put the whole eggplant, not cut, in a baking tin and place in a very hot oven for 45 minutes. 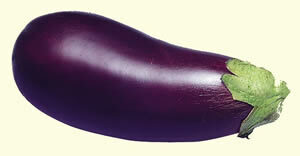 The inside of the eggplant will cook while the dark skin will stay whole. When you take the eggplant out of the oven, cut the skin with a sharp knife and let it cool down. When the eggplant is cooled down sufficiently, open it up and scoop out the inside of the eggplant and put it into a container. Throw away the black eggplant peel. Peel the garlic cloves and press the garlic with the garlic press into the eggplant. Add two tablespoons of mayonnaise (you may need to add more according to your taste). Add the salt, pepper, and hot paprika according to your taste. Now mash the mixture together with a fork. Some people use a blender, but I prefer the good old fork, because there is just less cleaning up afterwards. Now taste it. Does it need more spices? So add them! Hmm, too spicy? Well next time go easy on the hot paprika. Put it in the refrigerator and serve it cold. It is a great dip for pita bread as well as regular bread.